Fairfield American's Little League team, pictured at ESPN's Baseball Tonight studios in Bristol, toured ESPN studios on Monday before its game against Scarborough, Maine. 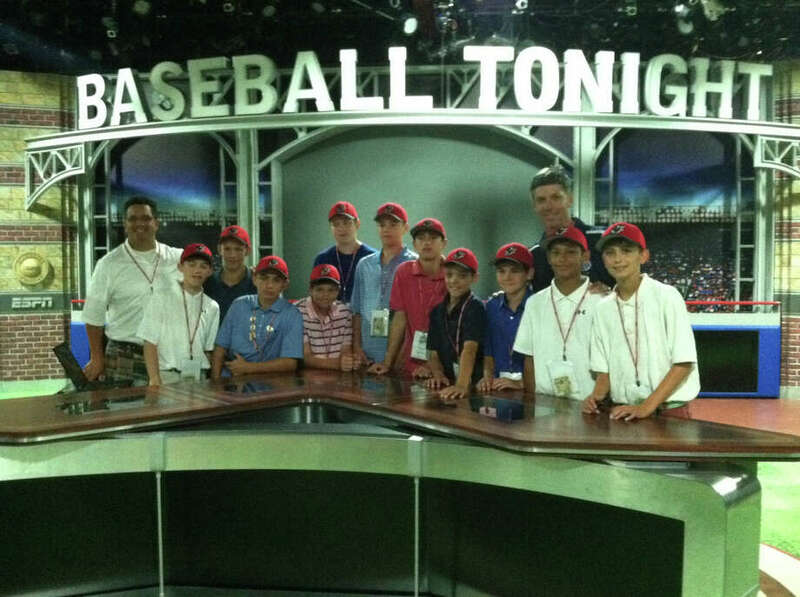 Fairfield American's tour of ESPN's Bristol studios marked a rare occasion when the slugging little leaguers did not make contact. Scott Van Pelt, a SportsCenter anchor and host of his own ESPN Radio show, went to the University of Maryland with American's manager Bill Meury. "I got a text from (Van Pelt) and he said `hey, look me up,'" Meury said. However, because of Van Pelt's busy schedule, Meury and the team just missed him. "He was prepping for the 1 o'clock SportsCenter," Meury said. "We figured that was more important." Scarborough, Maine coach Neal Pratt was disappointed at the abuse he and his players received from Fairfield American's cheering section on Monday night in the teams' head-to-head contest. "I've been coaching this all-star team for five years," Pratt said. "And that's the worst I've seen parents behave anywhere." Pratt did not go into specifics, but said he felt compelled to request that a volunteer sit in Fairfield's cheering section midway through the game. The verbal barbs ceased after that. Meury commented on the matter Tuesday afternoon saying "One or two of our fans' enthusiasm may have gotten the better of them, but 99 percent of our fans are first class." American will play on NESN on Wednesday night and Thursday morning. American is the only New England regional team that does not get NESN on its cable package. Fairfield County is the only county in the region without access to the network. Becaus of its infamiliarity with it, kids had varying ideas of what the New England regional sports network is. "It's New England's version of the YES Network," American catcher Biagio Paoletta said, referencing the Yankees Entertainment & Sports Network. Paoletta's is not a false statement, except NESN launched in 1984 and YES began in 2002. Despite playing every round robin game at 8 p.m., the late start times have not adversely affected Fairfield. "They've been playing late games for the entire week," Meury said. "I think they're pretty comfortable with the schedule." American's games have gotten done at around 11 every night. And although "lights out" is 10:30, Fairfield's been able to wind down after playing. "They like to whisper well past 10:30," Meury said. Meury also credited the East Regional staff and its flexibility. American's start was delayed nearly 1 hour, 45 minutes on Monday due to the five, lengthy games that had to be completed before Fairfield could start. "(The staff) are great with the schedule," Meury said. "We started our batting practice an hour later than we were supposed to. We were able to go to the dining hall an hour later. They take care of the teams in a good way." Despite the down time, Fairfield's developed a routine. "They're pretty good about eating during the day, getting some rest and watching a movie or playing some video games," Meury said. "But when 6 or 7 o'clock rolls around, they're ready to go." Paoletta is leading the region in RBIs, with eight. But he's not even the top statistical hitter on his team through three games. Michael Ghiorzi is batting .625 through three contests, Paoletta's hitting just .600. Four of Fairfield's nine starters are hitting above .500, led by Ghiorzi. Ryan Meury's hitting .571 and Will Lucas is batting an even .500. "Right now I think they're pretty hot," Meury said of his team's offense. "They're swinging the bats well and look good there." American's 33 runs in three games is third-most of all United States teams. Only Bedford, N.H. and McAllister Park National from San Antonio has scored more. Bedford scored 35 runs in three games, McAllister Park plated 37 runs in three Southwest Regional games through Monday night..
Fairfield, however, has scored 33 runs in just 14 innings because of its two mercy-rule shortened wins. McAllister Park has also played only 14 innings. Bedford has played 18. Thanks to Wellesley, Mass. 's 9-5 win over New Hampshire on Tuesday, Fairfield's game against Massachusetts will be for the top-seed in Thursday's semifinals. Also, because of Massachusetts' win, the semifinal teams have been set. Coventry, R.I. and Scarborough, Maine have been eliminated. Wednesday's round robin games will determine the seedings and matchups in Thursday's semis. The first semifinal will pit the Nos. 2 and 3 seeds at 10 a.m., The top-seed will play the No. 4 seed at 1 p.m. Both games will be televised on NESN.